Lets know everything related to them today, right here, right now ! 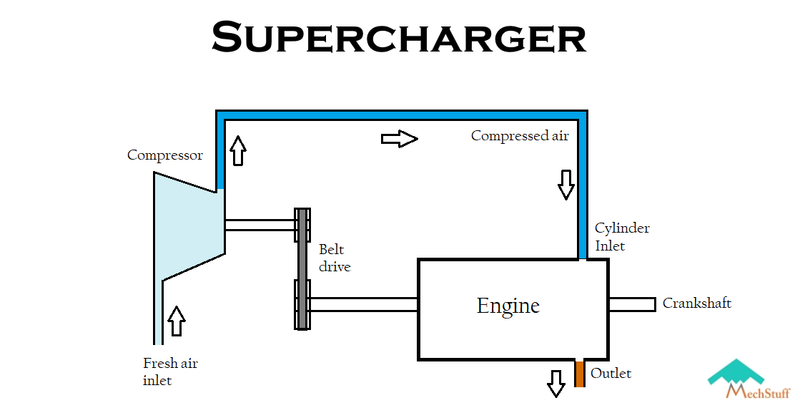 In simple words, Superchargers are pressure boosting devices(compressors) which increase the pressure of the air before letting it get into cylinder of the internal combustion engine ! And the process of increasing the pressure OR forcing more air to get into engine is called as supercharging. Why do we need superchargers ? Let’s keep this simple by not diving into those big lengthy formulas, alright. The power generated by engine is a function of the mean effective pressure aka. average pressure in the cylinder. Power is directly proportional to the average pressure. Pressure goes on increasing during compression stroke & goes on decreasing during exhaust stroke. So average pressure is calculated with the help of these data. More the MEP, more the efficiency of engine ! So if more air is forced & compressed into the cylinder, there will be an increase in the mean pressure & hence will produce more power ! This is why we need them – to force the air into engine ! Superchargers are basically compressors/blowers which takes air at normal ambient pressure & compresses it and forcefully pushes it into engine ! Power to the compressor/blower is transmitted from engine via the belt drive. The addition of extra amount of air-fuel mixture into the cylinder increases the mean effective pressure of the engine. An increment in MEP makes the engine produce more power. In this way, adding a compressor to the engine makes it more efficient. These are commonly used in the vehicles & are powered by the engine via a belt-pulley system. The air-fuel mixture enters the impeller at the centre. The air is then passed through diffuser, which increases the pressure. Finally the air makes it way through the volute casing to the engine. Root’s type contain two rotors of epicycloid shape. The rotors are of equal size inter-meshed & are mounted and keyed on 2 different shafts. Any one shaft is powered by the engine via a V-belt or gear train(depending on the distance). Each rotor can have 2 or more than 2 lobes depending upon the requirement. The air enters through the inlet & gets trapped on its way to outlet. As a result, pressure at outlet would be greater than the inlet. A number of vanes are mounted on the drum of the supercharger. These vanes are pushed outwards via pre-compressed springs. This arrangement helps the vane to stay in contact with the inner surface of the body. Now due to eccentric rotation, the space between two vanes is more at the inlet & less at the oulet. In this way, the quantity of air which enters at the inlet decreases it’s volume on its way to oulet. A decrease in volume results in increment of pressure of air. Thus the mixture obtained at the outlet is at higher pressure than at the inlet. Are there any other methods of supercharging ? Here, the inlet manifold is designed in such a way that the air gets automatically pushed into the cylinder. The air continuously tries into the cylinder but the intake valves open/close several times a second ! Every time the valve closes, the air just rams into it. This generates a pressure wave which travels in the opposite direction until it hits the plenum & gets reflected back. Now if the resonant frequency of the plenum & engine matches, this pressure wave carries more air into the cylinder doing the work of a supercharger. This type of method is generally adopted in large marine engines. It utilizes the bottom side of the piston for compressing the air. With proper timing of valves, this system gives an adequate supply of compressed air, as there are 2 delivery strokes to each suction stroke of each stroke ! Difference between Supercharger & Turbocharger ! Higher power output. This was whole point of studying & installing superchargers. Reduced smoke from exhaust gases. The extra air pushed into cylinder, helps the air to complete combust leading to lesser smoke generation. Quicker acceleration of vehicle. Supercharger starts working as soon as the engine starts running. This way the engine gets a boost even at the beginning leading to quicker acceleration. Draws power from engine. Though the overall mechanical efficiency is increased but it consumes power from the engine. The same job is done by a turbocharger without consuming extra power ! Increased heat generation. The engine should have proper heat dissipation systems as well as it should be able to withstand thermal stresses ! Induces stress. The engine must hold up against the high pressure & bigger explosions generated in the cylinder. If the engine is not designed considering these stresses, it may damage the piston head. I’m quoting this article in my academic essay on superchargers, but I’m curious as to who the author to this article is?